Apple recently released GarageBand 1.3 for iOS. Among its new features are the ability to import songs from your Music library and—on the iPhone 4S, iPad 2, and models newer than those two—to play or record with GarageBand while using other apps. But one of those new feature definitely requires iOS 6: the ability to create and save custom ringtones for your iPhone or iPad on those devices. Here’s how it works. 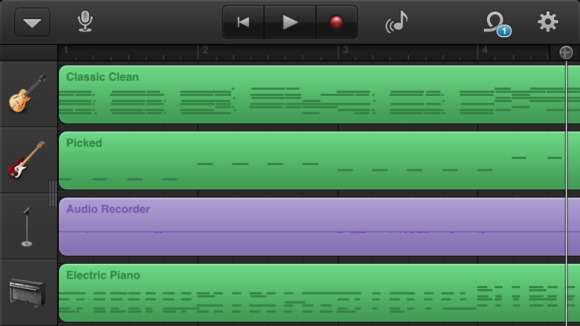 First, create your jingle in GarageBand. You’ll want your tune to be no longer than 30 seconds; otherwise, GarageBand will automatically truncate your tune at the 30-second mark anyway. If your song is shorter, your ringtone will play it as a loop. Tap Ringtone at the bottom of the Share menu to turn your recording into an alert tone. Once you’re happy with your new song, tap to go back into your My Songs list of recordings. (On the iPhone, tap the disclosure triangle at the upper left to find My Songs; on the iPad, just tap the My Songs button.) From the My Songs list, tap and hold on your recording, or tap the Edit button at the upper right; your songs will start jiggling like homescreen icons you’re rearranging. Tap to select your song if necessary, and then tap the Share icon at the upper left. Provide a name for your custom ringtone and then tap Next. Scroll down in the subsequent screen and choose Ringtone (the only option under Share Song As). On the Export Ringtone screen, provide a name for your jingle. When you continue, GarageBand should tell you that the ringtone was successfully exported and also that a backup of your song will be available via iTunes File Sharing. If you tap OK, you can find the ringtone in your iOS device’s sound settings, but GarageBand offers up a shortcut: the Use Sounds As button. You can use your recording as a ringtone or text tone, or assign it to a specific contact. Apple sells ringtones from popular music in the iTunes Store. Of course, with GarageBand’s new feature set, you can make your own ringtone from a song you own, right on your iOS device, without paying Apple anything extra. If you use iTunes Match, you’ll need to first make sure that the song is downloaded to your iOS device, which is a bit trickier in iOS 6; you’ll need to download the album or a playlist that contains it. 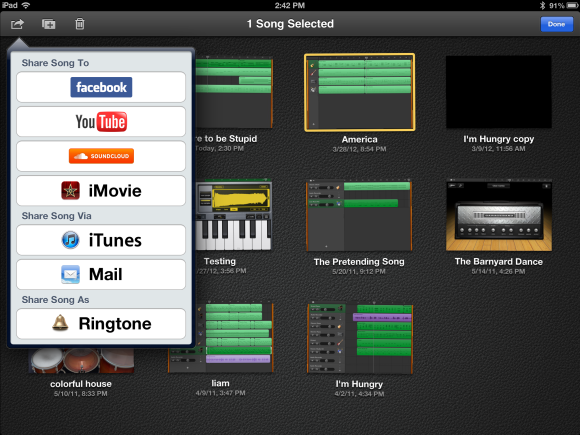 Tap and hold on the song you'd like to add to your GarageBand project. Make sure you set the recording window to Automatic, to ensure that the song you import doesn’t get cut off at the default eight bars. Then tap on the Loops browser, tap on the Music tab, find the song you’re after, and then tap and hold on it to add it to your GarageBand project. Trim the piece of the song you’d like to use as a ringtone, export it following the steps outlined above, and you’ll be good to go—and $1.29 richer, to boot.